Colour Tech Hair Studio is a full-service hair salon that has been proudly serving clients from Langley, Surrey, and across BC since 1991. All it takes is just a small change in your style to make life a little something special. Our highly skilled Hairstylists and Colour Technicians will transform your hair and help you create your own style. I tried to get my hair done while out of town, that didn't work out. Nobody knows hair like Terry. She pays so much attention to detail! All the stylists are so friendly and I would highly recommend this salon. OMG I love my hair! You guys definitely know what you're doing. I'm definitely coming back. I hate going home after my hair is done! This place is so much fun. In January of 2017, my hairstylist of 20+ years announced she was ready to retire in March of 2017. It didn’t take me long to realize that becoming the new owner might just be the opportunity I had been waiting for. If your gut thinks it’s a good idea, good business decision or for any other reason then it normally is a good idea. Buying a business is, of course, a lot of hard work and requires effort round the clock. Since I had a core group of unbelievable talent to work with making that decision was so much easier. As the third owner of Colour Tech Hair Studio and the only owner who is not a hairdresser, my enthusiasm to grow this business is what captured my attention. I left my 38+ years of dedication working for OEM companies and took a leap of faith when I decided to take over Colour Tech. Having known the staff for the last 20+ years, I was certain the transition would be amicable. And so, I set out to make a difference. My goal was to increase our presence across the lower mainland. From root touch-ups to full-on colour corrections, this was the time to move the needle with the help of Social Media! The ability to deliver results, not just once but every time, was not going to be enough. This was the start of many magical days to come. By creating a fresh new look with a change in the wall colours it provided a different feeling to an already familiar service for the existing clientele. A wider range of products and services were introduced along with some more decor changes. The changes quickly proved to be popular with our clients, staff and also peers within the industry. From the moment you enter our Hair Studio, you are welcomed and doted on by our cheerful host and experienced Colour Technicians. At the heart of everything we do we have the client in mind. 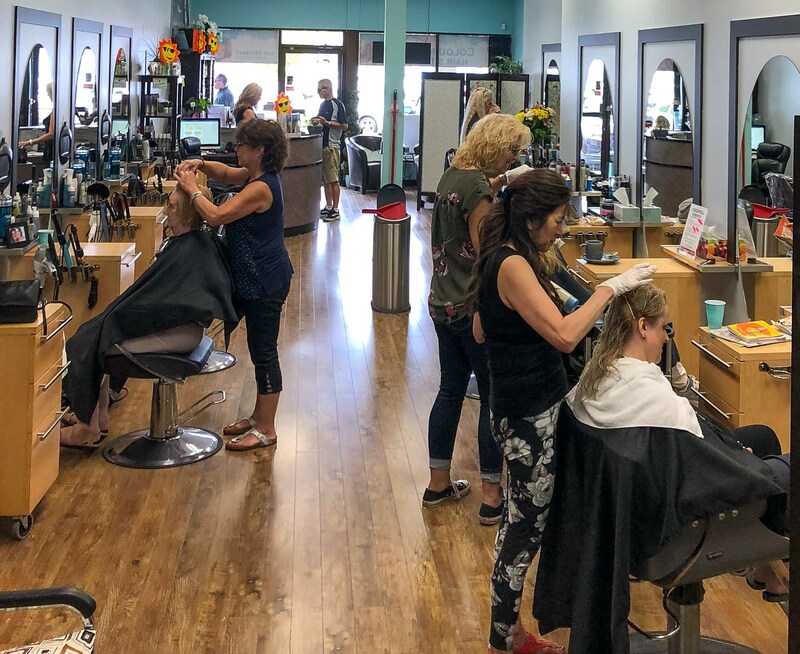 Our team has specialized in hair colouring and cuts for more than 35 years. Today’s client is better educated and more informed about hair than at any other time in the past. They know what they want, how to achieve it and have higher expectations – a ‘one-size fits all’ approach doesn’t work anymore. At Colour Tech we believe you should never stop learning. We always strive to expand the team’s knowledge of hair cutting and colouring techniques in order to keep up with the changing trends and provide clients with the best service possible. We offer free consultations, customized colours, and personalized service and advice to every one of our new and existing clients. We now offer a wider range of products, tools and accessories for all types of hair. We will also continue our search for the most effective products that will help our new clients with thinning or damaged hair from box-dyes or from years of neglect. We offer free hair consultations, customized colours, personalized service, and professional advice to every one of our new and existing clients.